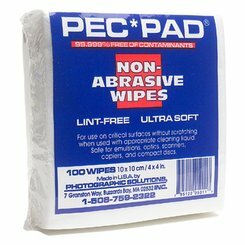 PEC-PADs are the ideal photo wipes for people who hate photo wipes! Until PEC-PADs came along, photo wipes fell apart, left lint, and scratched emulsions. PEC-PADs are extremely strong, lint-free, and so soft and pure (99.999%), that it is almost impossible to scratch an emulsion with them. PEC-PADs are so soft they can be safely used to clean all types of sensitive surfaces; scanners, CDs, mirrors, lenses, telescopes and more.